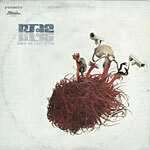 Since We Last Spoke was RJD2's 2004 follow up to Deadringer! The critically acclaimed album was met with somewhat mixed reviews from fans of the first album and The Horror EP, but only because of its more somber and slightly depressing approach, compared to the previous releases which had great upbeat and heavy hitting vibes from his epic funk and soul collages. In hindsight, no one ever said it was bad...it was just different but still dope. Also comes with those two newly added bonus tracks!